This is my story about discovering our beautiful son Joshua had Kabuki Syndrome. At the time he was diagnosed there seemed to be very little awareness of KS in our society, but thanks to the incredible work of Peta and her team this is beginning to change. Joshua is our first child and no doubt you can imagine our excitement as we headed off to our first ultrasound at 12 weeks, totally unaware that our lives were about to change so dramatically! It all began so “normally” (now there’s a word we didn’t hear again!!) as the chatty sonographer pointed out Josh’s hands and arms, his feet and tiny little legs crossed at the ankles and strong heartbeat. Suddenly though, she went quiet and I knew something was wrong. Josh had a nuchal translucency (fluid at the back of his neck) of over 8mm (normal is considered to be between 1-2mm) This screening test is most commonly used to detect Down’s syndrome and after a few minutes we were told our chances of having a baby with this syndrome was 1 in 7 when for my age it should have been 1 in 1500! We were immediately sent to another hospital for a CVS and then waited through a long weekend for the results. When the results came back they didn’t show any abnormalities and so we thought it was just a “false alarm”. Thinking back though, I do remember the doctor telling us it could be one of those very rare chromosomal conditions, but they were so rare we shouldn’t worry. Despite the doctor’s reassurance what followed was an anxious pregnancy with multiple ultrasounds. At 37 weeks, because Josh had stopped growing, our little boy was delivered by emergency caesarean section. When Josh arrived he was the most adorable tiny bundle (just over 5lbs). He had an amazing head of white/blonde hair and because he was jaundice he looked like he had a suntan! To us he was absolutely perfect. The first sign that there may have been something wrong came when Josh was 1 day old. A nurse noticed Josh’s sacral dimple and asked me, just before she went off duty at 11 o’clock at night, if I had heard of spina bifida!! After a sleepless night and countless tears the paediatrician arrived and looked at Josh and said of course he didn’t have spina bifida and that he was just fine, Aah! Relief! Another false alarm. Great we thought and 8 days after Josh was born we headed home. The first weeks of Josh’s life were wonderful but challenging. Our little boy was home but he was tiny, sleepy (during the day, awake all night!) and still jaundiced. He struggled to feed, projectile vomited and didn’t put on weight. However, being naïve and new to parenthood we continued to think everything was just fine. When Josh was 4 weeks old he and I ventured off to Mother’s group. Over the next 8 weeks it became increasingly obvious that Josh was not like the other babies. He was tiny, he was still not smiling by 12 weeks and was a “floppy”, low tone baby unable to hold his head up. Despite reassurances that he was fine I obtained a referral to another paediatrician. As a result we found ourselves on Christmas Eve taking Josh for blood tests and being told that our son had Fragile X, or Turner’s Syndrome, William’s Syndrome or perhaps, Prader-Willi Syndrome!!! Christmas Day was spent on the internet reading volumes about all these different conditions and trying to determine which one we thought Josh had. Of course when the blood test results came back they showed that Josh had none of these conditions! The paediatrician then referred us to the Genetics Department at the Royal Children’s Hospital. As fate would have it our appointment was set for April 1st with Dr Sue White. 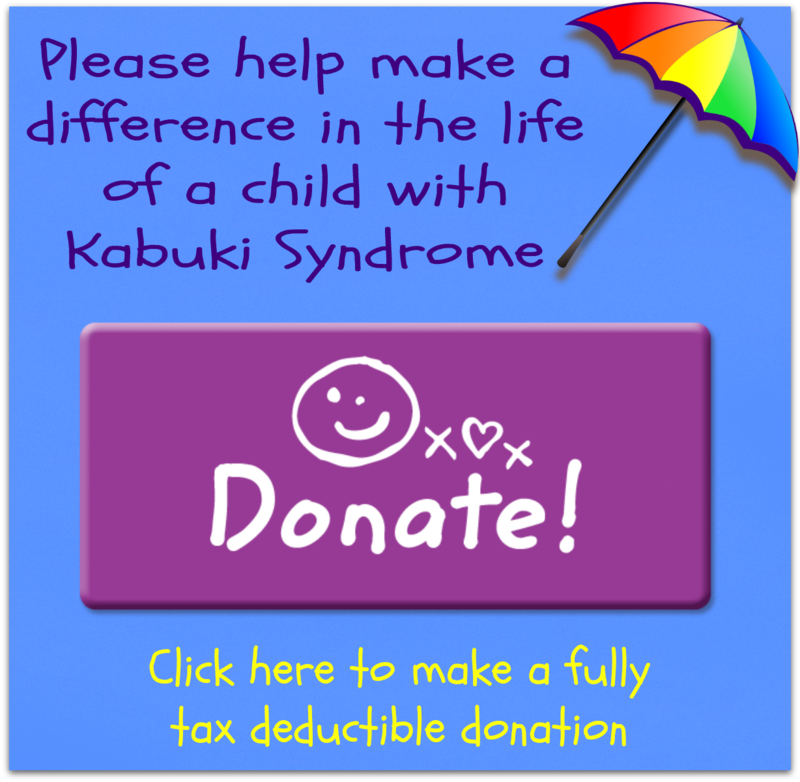 After spending a few minutes with Josh, Sue told me she thought our little boy had the features of a condition called Kabuki Syndrome - what?!! I had been a Special Education teacher for many years and I had never heard of such a condition. She must be joking (it was April Fool’s Day after all) This was where she was meant to tell me it was all okay and just another false alarm. Instead, Sue sent us to have photos taken of Josh, which she then shared with colleagues. Six weeks later we received a letter confirming the diagnosis. I still acutely remember that feeling of loss and the grieving for the “normal” child I would never know. I remember being overwhelmed and wondering what I had done to deserve this. However, as I held the letter, my eyes just kept going to the final sentence where Sue had written, “this diagnosis does not change who Joshua is”. How true! Fast–forward five years and hours upon hours of therapy, wonderful highs, traumatic lows, tears of joy and tears of despair and today I write this as the proudest Mum in the world. I have a gorgeous, warm-hearted, bright, sensitive, compassionate little boy who continues to amaze me and inspire me a daily basis. On that day back in April 2006 when I heard the words “Kabuki Syndrome” I never thought I’d feel this way, but our Josh is such a gift and such a blessing that whatever I did to deserve this I am so glad I did it! !